Searching for jazz bars in St Petersburg? Try our list presented here and enjoy live jazz gigs and late-night blues sessions. Saint Petersburg is not only the culture capital of Russia, the city of Imperial splendor or the Russian October revolution, but it is also the birthplace of jazz in Russia. It has undoubtedly become an epicenter for this musical style in the last 25 years, but unfortunately very few people around the world know that. Today the city boasts an impressive array of jazz clubs for jazz fans of different ages. From underground jazz clubs to tiny bars, and open music festivals or auditorium like spaces, you can hear something amazing every night of the week, all the year around. Below a list of the most popular jazz bars in St Petersburg Russia for an awesome night out with friends or even on your own. St Petersburg is the jazz capital of Russia, so the Jazz Philharmonic Hall is the place to come to hear the best professional jazz musicians, both local and international. Each year in late June, early July the international jazz festival, “The Swing of the White Night” is hosted. The Hall has an elegant atmosphere with a stage, balconies and comfortable tables and the performances feature high quality musicians. On the second floor you can also visit the Museum of Petersburg Jazz. A must for Saturday night! "Quaint and True to JH"
St Petersburg features many jazz clubs and the Jimi Hendrix Blues Club is a refreshing change as it provides a relaxed atmosphere in a quaint cellar where you can dine and listen to great music. Live music is featured daily, and concerts start at 8:30 pm. Memorabilia line the walls and ceiling, and if you want a great place to relax and immerse yourself in the music of the great Jimi Hendrix and other renowned blues performers then you won’t be disappointed with this jazz/blues club. "One of the Best Jazz Bars in St Petersburg "
Small and intimate, this is a must-visit if you like a range of music from jazz, blues, jazz-rock to avant-garde music. While the club is small there’s room for locals and visitors and here you’ll be amongst the city’s jazz aficionados and artsy scene, in other words, people who “know their jazz”! The JFC Jazz Club features top of the range performers. It’s wise to make a reservation or you might find yourself standing. As with other cellar bars it’s a bit hard to find, but well worth visiting once you’ve found it. "Lively, Fun, Great jazz, Filled with locals"
The Hat is best described as a “classic American” jazz bar in the style of the 40s and 50s. Whisky and bourbon are popular and cocktails are great too. Jamming is encouraged. Come here till closing, or just stop by for a drink or some food and then move on – your choice. 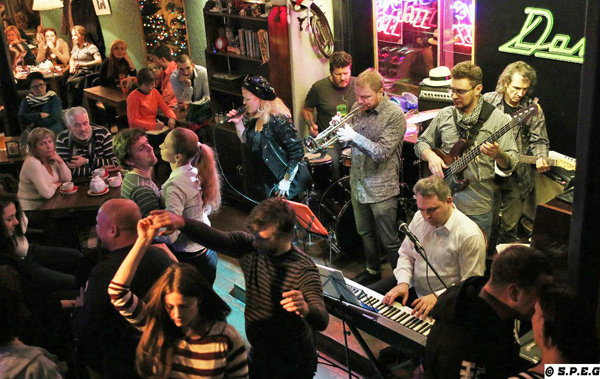 This popular St Petersburg jazz bar is open every night from 7 pm to 3 am attracting both locals and tourists. It’s a fun place to visit if you’re a jazz fanatic and especially so if you want to take part in a jam session. "Good Music, Good Ambience, Easy to find"
Dom 7 Jazz Bar is easy to find as it’s near the Church of the Saviour on Spilled Blood. This popular St Petersburg jazz bar caters for both tourists and locals and this is where you should come if you want a relaxed setting with good food, cocktails, and music. Live shows are featured from 9:30 pm and promote both local and international bands. They’re open from 10 am to midnight Sundays through Thursdays, and close at 2 am Fridays and 3 am Saturdays. If you love cozy little places with a crowd of enthusiastic jazz fans, Dom 7 is a great hangout sort of place. Reservations are advised for the restaurant.